Many orthopedic surgeons and ambulatory surgery center operators are delighted with the CMS' mid-July announcement that it's considering paying for total knee and hip replacement procedures in outpatient settings. But lots of hospital leaders are not. "I did a knee today at 7:30 a.m., and the patient left at 12:30 happy and with pain under control," orthopedic surgeon Dr. Louis Levitt said late last month; Levitt's medical group owns Massachusetts Avenue Surgery Center in Bethesda, Md. "If Medicare approved this, it will be a substantial boon to our ambulatory surgery business, and physicians will get more comfortable with the idea." Hospital leaders are wary, however, for both financial and clinical reasons. They fear losing substantial inpatient revenue from total joint procedures—one of their bigger profit centers—to ambulatory surgery centers, as they've previously lost many other surgical procedures. In addition, they and doctors on staff aren't necessarily comfortable at this point doing the operations in either hospital outpatient departments or ambulatory surgery centers. A CMS decision to pay for total joint replacements in outpatient settings would speed the migration of thse procedures out of the hospital by encouraging more private payers to cover them. "We haven't seen a lot of data that would show performing those procedures in ambulatory centers with no inpatient stay would result in better outcomes," said Sabra Rosener, vice president of government affairs for UnityPoint Health, which operates hospitals and clinics in Iowa, Illinois and Wisconsin. A CMS decision to pay for total joint replacements in outpatient settings would speed the migration of these procedures out of the hospital, experts say. One big factor is it would embolden more private payers to start paying for the operations in ambulatory settings. "As soon as it's approved by CMS, then commercial payers say yes," said Naya Kehayes, practice leader for ambulatory surgery at ECG Management Consultants. "I've got hospital CEOs calling me and asking how much of their volume is at risk, and what if it totally blows up." On July 13, the CMS proposed to let traditional Medicare pay for total knee arthroplasty in hospital outpatient departments for the 2018 coverage year, reviving a proposal the hospital industry shot down in 2012. Last August, a CMS advisory panel recommended removing total knee procedures from the inpatient-only list. Comments on the current proposal are due by Sept. 11. More surprisingly, the CMS also sought comments on whether Medicare should pay for total and partial hip replacements in both hospital outpatient departments and ambulatory surgery centers. Experts said providers should prepare for the shift as soon as Jan. 1, 2018, for total knees. "It's pretty clear that regardless of provider sentiment, CMS is looking to move ahead with this," said Eric Fontana, managing director of research for the Advisory Board Co. "For many providers this is going to be a shot across the bow. It will cause them to plan ahead, especially with the knowledge that if total knee passes, total hip will follow closely." That would be a jolt for hospital managers, because most U.S. patients who receive total hip or knee replacements, even those under 65 covered by private insurance, still are operated on in an inpatient surgical unit. They often spend several days in a hospital bed, then move to a skilled-nursing or rehabilitation facility or receive home healthcare. But that's changing at an accelerating pace, say orthopedic surgeons, hospital and ambulatory surgery center administrators, and outside analysts. With advances in surgical technique, anesthesia and pain control, a growing number of surgeons are moving more of their total joint replacement procedures out of the hospital, performing them in ambulatory surgery centers. Some are sending their patients home within a few hours, while others have their patients recover overnight in the surgery center or hospital during 23-hour stays. These surgeons say very few of their patients require skilled nursing, rehab or home healthcare. More than 200 ambulatory surgery centers around the country are performing outpatient joint replacements, according to Steve Miller, COO of the Ambulatory Surgery Center Association, which supports the CMS' proposed rule change. That's up from about 25 centers doing these procedures three years ago. A relatively small number of Medicare patients enrolled in Medicare Advantage plans already are having their joint replacement operations done in ambulatory centers, Miller said. "I could do maybe 20% of my Medicare patients on an outpatient basis, as long as they have the support and structure at home to help them recover," said Dr. Matthew Weresh, a partner in the 30-doctor Des Moines (Iowa) Orthopaedic Surgeons group. 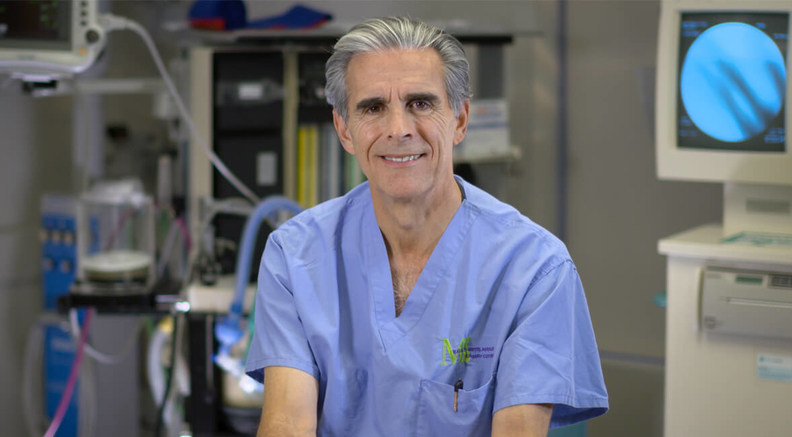 He and his colleagues are preparing to start doing joint replacements in an ambulatory surgery center later this year. "It's a great move by Medicare." An estimated 25% to 50% of total joint replacements could be done on an outpatient basis, based on patients' health, weight and home support, according to the ASCA's Miller. "There's more and more comfort among surgeons who are coming out of residencies where they trained to do surgeries on an outpatient basis," he said. "The volumes are doubling year over year." One indicator that a significant share of Medicare cases could be done in an outpatient setting is that in 2015, the vast majority of the more than 430,000 total knee replacements on Medicare patients were billed at the lower rate for cases without major complications compared with those billed for complicated cases, according to CMS data. "That means nationally there's a big pool of cases that could move out of the hospital," Fontana said. "But there's no certainty of that." The pace of change, however, will depend on how much the CMS decides to pay for outpatient joint replacements, ECG's Kehayes said. The rate set by the agency will signal how much it wants to shift cases to outpatient settings. "If they don't price it high enough, it won't matter," she said. The CMS' proposed inpatient rate for uncomplicated total knee cases for the 2018 coverage year is $12,381, while the proposed outpatient rate is $9,913. Moving more of these procedures to outpatient settings would pose a major threat to hospital finances, since total joint replacements are one of the largest and most profitable service lines at many hospitals, according to hospital administrators and outside analysts. In 2015, the latest year for which CMS data are available, more than 658,000 Medicare beneficiaries received a total hip or knee replacement. Meanwhile, in 2014, those two procedures cost the government more than $7 billion for the hospitalizations alone; spending for the full continuum of care ranged from$16,500 to $33,000 per case. The American Hospital Association, which opposed paying for outpatient joint replacements in the past, hasn't decided how to respond to the current proposal. "We're still in the early stages of talking to our members," said Joanna Hiatt Kim, the AHA's vice president for payment policy. She noted continuing concerns due to the prevalence of chronic conditions and limitations on daily living activities among seniors, as well as the challenge of managing pain. In its July rule, the CMS recognized that only a select group of total joint patients could potentially be operated on in an outpatient setting. On total knee arthroplasty, the CMS wrote that "we expect providers to carefully develop evidence-based patient selection criteria to identify patients who are appropriate candidates." On total and partial hip replacement, the CMS wrote that "patients with relatively low anesthesia risk and without significant comorbidities who have family members at home who can assist them may likely be good candidates" for an outpatient procedure. If and when the CMS approves payment for outpatient joint replacement, hospitals participating in Medicare's mandatory and voluntary bundled-payment pilot programs for inpatient total joint replacements have another big financial concern. They wonder whether the CMS will adequately adjust those bundled payments to reflect that their inpatient surgery units will be left with sicker, higher-cost patients while healthier patients shift to outpatient settings that aren't part of the bundled-payment program. 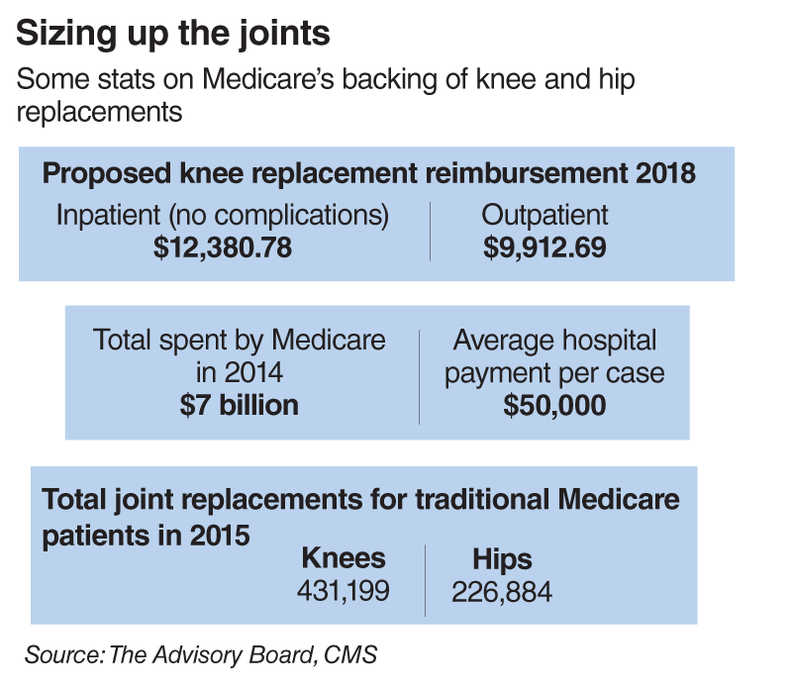 That's an issue for the nearly 800 hospitals in 67 markets around the country participating in the Center for Medicare and Medicaid Innovation's mandatory Comprehensive Care for Joint Replacement program for total knees and hips, which started in April 2016. They now are receiving payments for the first six months of the program if they met cost-saving and quality targets. The CMS declined to disclose any results. Hundreds more hospitals around the country are participating in the innovation center's voluntary Bundled Payments for Care Improvement pilot for total knees and hips. "You'd be moving the easiest cases out of inpatient, and then your average expenses will look a lot higher," the AHA's Kim said. "CMS needs to take action to make sure hospitals aren't penalized. We're troubled they didn't saying anything about that." The CMS declined a request for an interview. Most orthopedic surgeons continue to do their joint replacements in the hospital, though many are shortening length of stay to one day or even 23 hours in preparation for performing the procedures on an outpatient basis. Still, those surgeries are being billed at hospital inpatient rates, rather than significantly lower ambulatory surgery rates. So payers aren't reaping the full savings. The shift is driven by patients' and payers' desire to reduce costs, increase convenience and satisfaction, and lower the risk of hospital-acquired infections. Surgeons say doing joint replacements on an outpatient basis cuts costs by as much as half, although reimbursement is also lower. Randy Gross, administrator of the Massachusetts Avenue Surgery Center in Bethesda, said insurers have told him they're paying his center 40% to 50% less for total joint replacements than they're paying for inpatient procedures. John Vassos, 55, of Potomac, Md., had his right hip replaced at the physician-owned Massachusetts Avenue center last December. He was pleasantly surprised when his surgeon, Dr. Gautam Siram, first told him ambulatory surgery was an option. His primary-care physician, however, was uncomfortable with the idea. "I don't like staying in the hospital," said Vassos, 55, who said he hates catheters and worried about the risk of hospital-acquired infections. After the operation, he was walking without crutches within a few days. He now does 5-mile runs and plays tennis without pain. He's even looking forward to having his left hip replaced soon by Siram. "I can't even tell you how easy it was," said Vassos, who runs his own company selling office equipment. "I really enjoyed the experience."